Well this is a bit of departure, but I did say I was going to review it all. My daughter's a big fan of the PG rated late nineties adaptation of American author R. L. Stine's horror shorts. They're fun and exciting little self contained stories with Stine getting the fine balance of scary and family friendly right every time and the US/Canadian television interpretations are well made and true to the source with Stine even beginning each with a small narration. Each episode usually drops one or more children, quite often siblings into evil and frightening situations where they, without adult help, have to use their own abilities and imagination to win the day. It's child friendly, so there's never any deaths, the children are never on the receiving end of direct violence and there's always a happy ending, yet Stine, as my daughter will attest, certainly knows how fashion a stressful situations a child can get into. Egyptian mummies, Monsters, Werewolves and possessed magic items all story themes played with but it's the two part adaptation of his first book published in 1992, and my daughter telling me all about it after watching it on Netflix that's the focus of this review. Brother and sister Amanda (Amy Stewart) and Josh Benson (Ben Cook) have been forced to relocate some five hundred miles to the town of Dark Falls for their fathers work. It's your typical children's haunted house of horror, the building itself is dilapidated and in desperate need of modernisation and a lick of paint, the neighbour hood is overgrown and run down, and the neighbours act suspiciously and keep to the shadows. No sooner than they arrive Amanda begins to feel something isn't right briefly glancing a face at the bedroom window that of course her parents disregard as a gust of wind or a trick of the light. Things go from bad to worse and in full scooby-doo / gothic-panto glory lightning, thunder, sinister piano music, mystery voices and barking dogs are all used to tell us the Bensons are in for a rough couple of days. Part 1 ambled along pretty safely; overly friendly neighbours introduced themselves yet shied away from an old family wreath reputed to bring good luck that had been hung, weird pale skinned neighbourhood kids acted strangely and even a few good scary moments, all directed at Amanda with strange sightings, something breaking at the wall in her wardrobe and even a ghostly visitation and dire warning. It was fun, reasonably coherent and well acted family friendly entertainment; not especially my cup of tea but I could go with it. 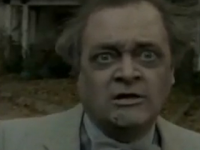 I came into this understanding it was, as my daughter put it, all about the living dead and if these walking talking neighbours were the zombies then that was fine. I was wrong though and nothing quite prepared for me for where it was all going in part 2. Eventually with the children searching the woods for Petey their dog who'd escaped, they stumbled upon a graveyard, and the entirety of the neighbourhood who had seemingly convened for a town council style meeting. The realtor (estate agent) was here, as was the neighbours daughter, the town fireman, the butcher, the baker and the candlestick maker (probably); however gone was the slightly off tone skin tone, and friendly rational demeanour. Here were zombies, grey and blemished rotting undead parasites discussing how they needed to siege the house for the Bensons blood. There was no sugar coating it; they were dead and they wanted Amanda and Josh to join them. Giving the zombies the two states is quite a fun little idea and not a million miles away from Dead & Buried. On the one hand they're living out some strange fantasy existence pretending to be who they once were to gain the new families trust, however underneath they're vampiric brainless corpses with a singular uncontrollable appetite for blood. They're not who they used to be; they're an echo of their old self, a charade able to remember but only in the pragmatic sense that this might help them to satiate their hunger. For a simple children's story Stine shows a surprising amount of sophistication and the story is refreshingly complete and compelling. The make up is edgy with more than passing resemblance to Romero's offspring, albeit with blood itself off the table, their movements are purposeful and menacing and the final siege of house is scary and suitably relentless with undead bursting through walls and gnashing their teeth, and for a moment I could almost have mistaken it all for something far more grown up. 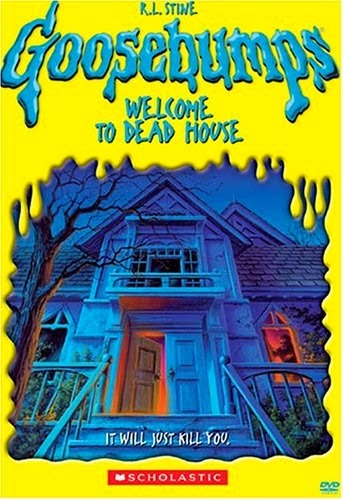 Welcome to Dead House is fine example of how to make children's horror fun and light yet also not insulting or overly dumb. A great little self contained story; narrative isn't as rigid as it perhaps would be in an adult tale, with several scenes of misdirection never really fleshed out but it all works for a target audience that doesn't really need it to. The central story feels strong and satisfying, production values, music and acting are all as competent as you'd want and the zombies are well made up and genuinely intimidating. Undeniably one for kids (probably not small ones though) there might just about be enough here for big old hairy kids like me too, 6/10.